I don't know about you, but I am a sucker for sunsets. When I was younger, everytime I see sunsets, I associated them with sadness. It's like day turning to darkness, all hope is lost and chaos is about to begin. But that was then; now I see sunsets in a different and beautiful way. It is, for me, one of mother nature's ways of showing off. So whenever I see one, I snap a shot to capture all that glorious moment. Where can you get a beautiful view of a sunset when you're in a city, but on a roof deck or a veranda of a high-rise building, right? 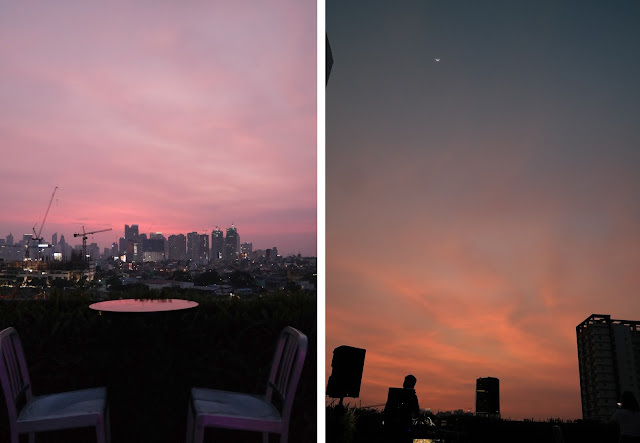 I used to spend a lot of time during my days off from work on my sister's pad's balcony; sipping coffee, admiring the sunset and talk endlessly with C until those cerulean blues get a well-deserved shut-eye. Those moments added to the reasons why I love sunsets so much. 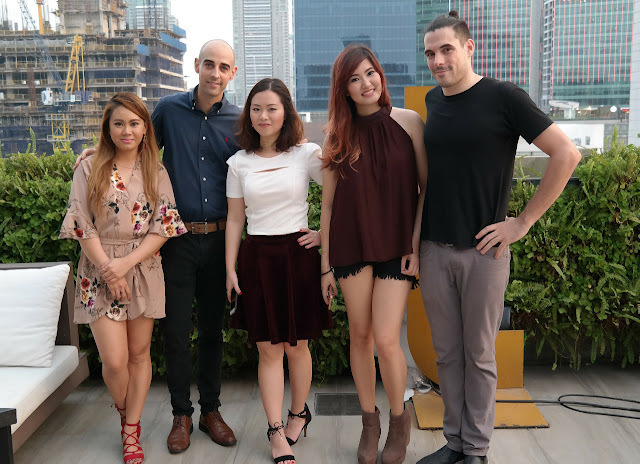 Deep Sunsets is the new concept of a late afternoon chill party in Manila, mixing the best of modern gastronomic cuisine from one of Asia's best restaurants Vask Tapas Room and top, tropical, future and tech house music together with international DJs Charlie, Cholo, Italo and Shoyd. 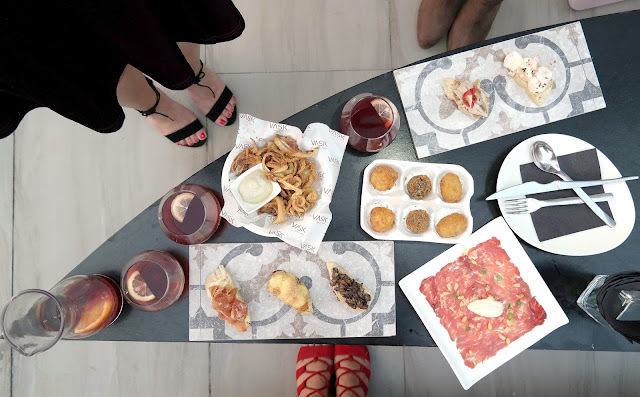 Me and two of my blogger friends attended the soft launch of this new venture by The Loop Party's Alvaro Martinez and Daniel Carrasson together with Vask tapas Room. We got to enjoy good food & drinks and an ah-mah-zing view of that Sunday's sunset and the Makati skyline. Also got a glimpse of what's in it for guests for the upcoming Sundays at Deck. Rabas - fried fresh squid with basil mayonnaise dip. This is also what is known as calamares or calamari. The dip didn't have a strong basil taste which I like and the squid aren't oily or greasy. Assorted Croquetas - are small bread-crumbed fried food roll containing, usually as main ingredients, mashed potatoes or ground meat (veal, beef, chicken, or turkey), shellfish, fish, cheese, vegetables, and mixed with béchamel or brown sauce, and soaked white bread, egg, onion, spices and herbs, wine, milk, beer, or any of the combination thereof, sometimes with a filling, e.g. sautéed onions, mushrooms, or boiled eggs. We had assorted ones, and my favorite was the one with squid ink filling. The croquetas are also place on a cute glass egg tray. Pintxos - these are small slices of bread upon which an ingredient or mixture of ingredients and usually eaten as an appetizer, accompanied by a small glass of wine or beer. We had the following varieties: Jamon with Parmesan mousse, Atun and Piquillo peppers, Crab Hollandaise, Roast Beef and Escalivado and Gambas Aioili. My top two are the jamon with Parmesan mousse and the gambas aioli. Wagyu Beef Carpaccio - this carpaccio uses Australian Mayura wagyu beef slices slithered with Parmesan ice cream and sprinkled with bits of Pine nuts. The combination was out of this world. Some may not be fond of raw beef, but me? I love carpaccio! My favorite of all the dishes that we tried that afternoon. Paella - is a Valencian rice dish consists of white rice, green beans, meat, white beans and seasoning such as saffron and rosemary. I really don't know how a good paella should taste but this one is good for me. The consistency and texture is great and the chicken pieces are larger than the usual bite size. Sangria Jar - is an alcoholic beverage of Spanish origin which is a punch, the sangria traditionally consists of red wine and chopped fruit, often with other ingredients such as orange juice or brandy. This version of Vask's Sangria has lemon only; the ones I've tried before have diced fruits mixed with the wine. This would also be good if the pitcher was in an ice bucket so it is chilled. But then, it's just a personal preference and I'm not really into wine either. 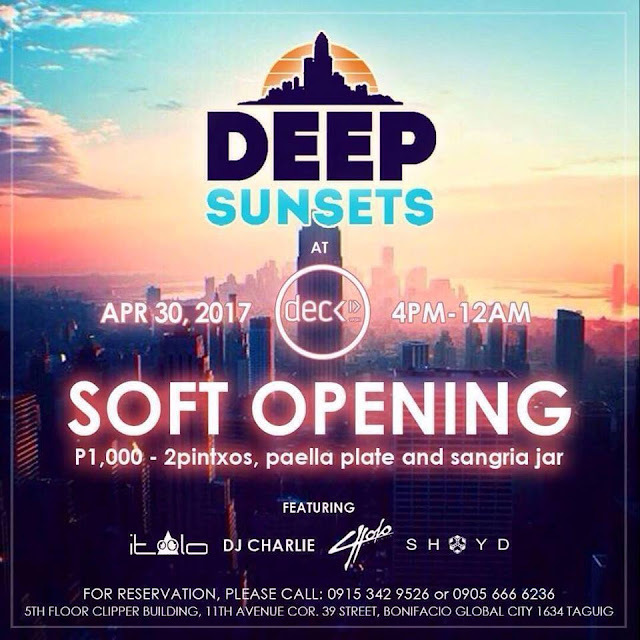 Deep Sunsets happens every Sunday (4:00pm to 12:00 mn) at The Deck at Vask Tapas Room 5th flr Clipp Center Bldg 11th Ave BGC. Visit their IG and FB for reservations and more info, deets are down below.